Patterns > Towels > Towels You Can Actually Use - Choose From 11 Different Designs - Practical and Pretty! 11 Designs to Choose from - Use drop down menu next to OPTION, to select WHICH pattern you want. 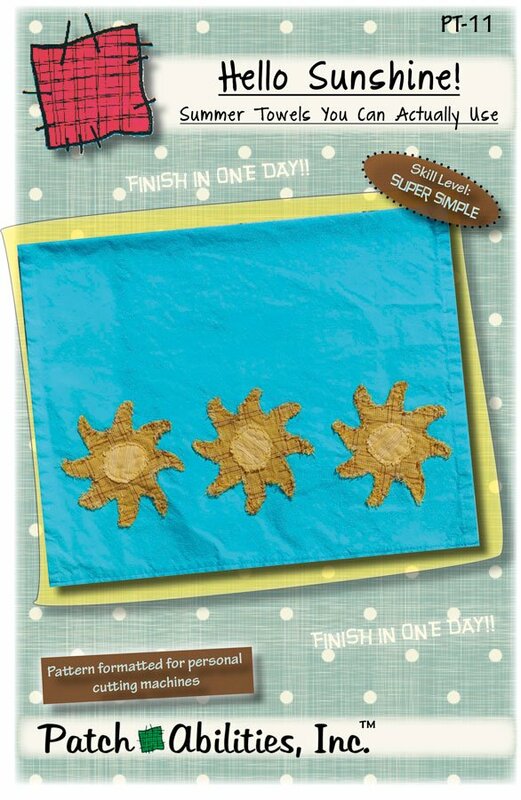 Different designs that you can choose from include: Sunshine (Sun) designs, Beach Umbrella, Firecrackers, Palm Tree, Sand Pails, Watermelon Slices, Campin' (Camping), Pinwheels, Dragonflys (Dragonflies), Fall Pumpkins, Presents. Use drop down menu next to OPTION, to select WHICH towel pattern you want. Towels you can actually use! Purchase one or all of the 9 designs featured! The idea behind towels you can actually use as told by Julie (the owner and designer of Patch Abilities) - "I have numerous beautiful appliqued towels, yet I seldom resurrect them from the bottom of the kitchen drawer for fear of getting them dirty and having to throw them in the washer (gasp!). I decided to create a set of fearlessly functional decorative towels that my whole family is welcome to use. The frayed edges (using homespun fabric) are what what makes them fearlessly functional because the more I wash them, the better they look! ...And I can finally stop guarding the pretty kitchen towels!"